itself against our legs, we are being marked with their scent. Consequently, we then have a group scent identification. These behaviors create group scents between cats in multi-cat households. This potpourri of familiar scents helps cats feel comfortable and secure in their home territory. 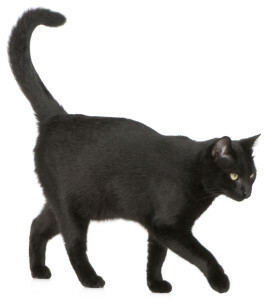 Any change in the scent structure of the home (eg., a new pet, person, a scent from another cat on your clothes or even a new piece of furniture) may trigger a highly objectionable form of scent marking–spraying. The cat sees this a threat to their territory and feels the need to make it theirs, thus marking it. Spraying is accomplished by squirting a powerful jet of urine backward onto vertical features of the environment–doors, windows, drapes, walls, clothes, etc.–about 8 inches above the floor. Both male and female cats, whether neutered or not, can do this. Cats regularly revisit sprayed areas to “freshen up” the scent when it starts to decline. When investigating another cat’s urine mark, the cat will display a curious, grimacing pose with its mouth partly open. It is using the vomeronasal, or Jacobson’s organ, which is located behind the incisor teeth in the roof of the mouth. This extra sense allows the cat to smell and taste an odor at the same time and it sends a powerful signal to the cat’s brain activating a territorial response. A product that has been available for many years and is very helpful in reducing the stress that leads to spraying. “Feliway” is an environmental spray that consists of a synthetic chemical that mimics the scent found in the gland near the lips of cats (the facial pheromones). Feliway is sprayed directly on spots that have been previously sprayed by the cat after it has been well cleaned. When the cat returns to the area to freshen up his mark, he sniffs the Feliway and gets the message that this spot has already been marked facially, no need for further action by the cat. It will also have a calming effect on cats in cat carriers and cages at veterinary clinics as well as in humane societies that have been spritzed with this product, it tends to be less traumatizing for cats. Even with the use of Feliway, the fundamental cause of the spraying problem must be addressed. It is necessary to reduce the cat’s exposure to the stimuli that triggers marking and altering the cat’s response. 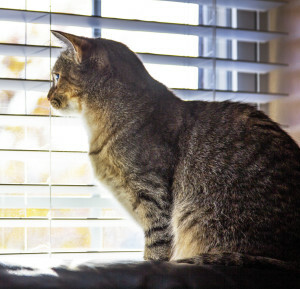 If it is caused by the sight of outdoor cats, the drapes must be pulled or the cat must be kept out of the room during the time of day when the strays are most likely to appear. When there outside cats present, they also are marking their territory outside, checking to see if anything needs to be refreshed. 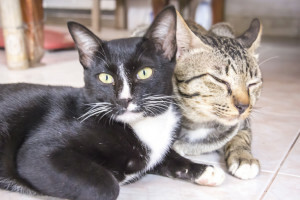 If tension between cats in the household is contributing to the problem, the competing cats may have to be restricted to separate areas in the house. (A gradual and systematic reintroduction may help to diffuse the anxiety between the cats.) “In households with a large number of cats, the problem may not stop unless the number of cats is reduced”.